If you like this blog, you can now vote for it in the Language Professionals Blogs category of the LexioPhiles "Top 100 Language Lovers 2011" poll. Just follow the link and vote for your favorite language professional blog. Of course, if you choose to cast your vote for this blog, I would much appreciate it! 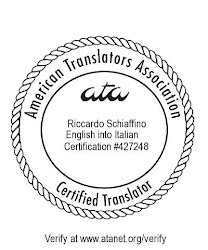 A big thank to all the readers who voted for About Translation! The results are in, and this blog placed among the top 25 language professional blogs, and the top 100 "language lovers" sites.